The campaign will feature a slightly tweaked academic logo and be in a number of news publications. Marketing company SPARK partnered with USF to create the $47,000 academic logo. SPECIAL TO THE ORACLE/JOE HICE. USF underwent a polarizing rebranding initiative when the new academic logo and tagline were released in September. Six months later, there is no sign of the initiative slowing down. USF will launch its $397,000 marketing campaign this month, featuring advertisements on more than 1,200 websites projected to enhance the university’s reputation. The campaign will feature the $8,000 reworked academic logo as well as the tagline that was voted on by alumni: "A Future Without Limits." 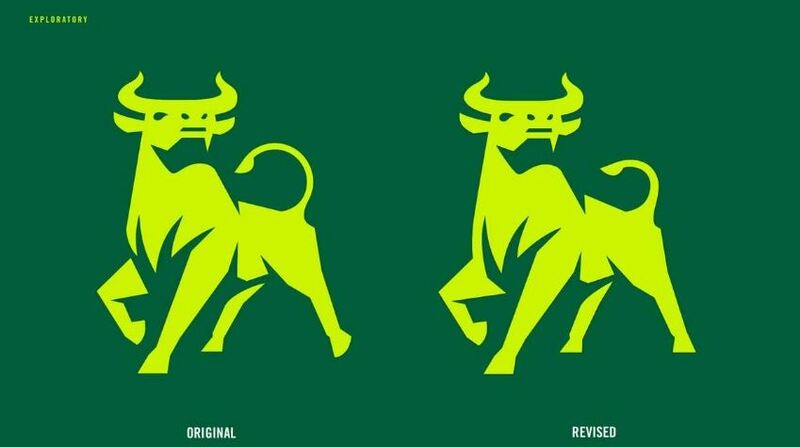 Each advertisement showcases a lime-green font that coordinates with the bull, which now has its chest and tail positioned up. After the backlash from alumni on the university "belief" -- "Ambition Over Tradition" -- Hice said he and his team decided to incorporate the feedback in future marketing concepts. “It’s kind of funny because it was never meant to be a tagline,” Hice said. “It was one of the four values that we had created for the advertisements and we heard loud and clear from the alumni that they didn’t like that. The survey listed five options and received an additional 201 suggestions. With a total of 1,805 participants, "A Future Without Limits" led with 468 votes. "United, we Shape the Future" received 366 votes, "Horns Up" received 459, "Be Bullish" received 172 and "Expect Us" received 42. According to Hice, "United, we Shape the Future" was designed for the academic strategic plan, "Horns Up" is the athletic theme and "Be Bullish" was a slogan used in the past. The marketing campaign will premiere a series of advertisements that will feature USF’s Morsani College of Medicine and new research technology such as Virtual Reality (VR). The advertisement features a skyline behind the Morsani College of Medicine in downtown Tampa on Water Street. This will be the first advertisement to premiere and it will be on The Chronicle of Higher Education website. SPECIAL TO THE ORACLE/JOE HICE. The advertisements will be published in print newspapers and magazines as well as digital banners and pop-ups. According to Hice, the advertisements will launch on websites including the New York Times, The Washington Post, The Ryder Magazine and Huffington Post. The marketing campaign is intentionally focused on increasing USF’s ranking. Associations such as U.S. News & World Report, Times Higher Education and QS conduct their voting during the spring. The initial phase for the campaign will last three months. During the summer, it will slow down before starting again in August for college recruitment advertising at a less aggressive pace, according to Hice. 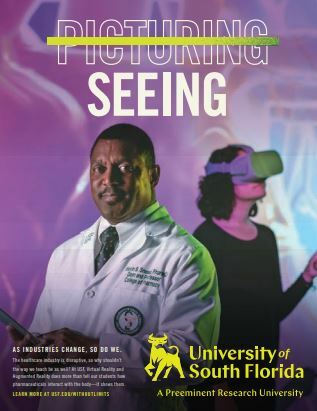 Dean of the College of Pharmacy Kevin Sneed and a woman wearing VR goggles are featured in this advertisement. According to the USF News Channel, Sneed’s project uses the simulator goggles to teach students how drug compounds react in the body. SPECIAL TO THE ORACLE/JOE HICE. The intent of the project is to target individuals with high incomes and high levels of education, such as university presidents, provosts and deans. “It’s important to get us out there so that university leaders from around the country will see USF and that will, in return, give us more funding at the state and national level,” Hice said. No formal focus groups were conducted for the advertisements, however, the marketing team received the approval and feedback from USF’s office of admissions, the provost, deans and President Judy Genshaft. In the summer of 2017, USF did an in-depth study with Ipsos — a marketing research company — and it was discovered that less than 1 percent of the population was aware of USF. 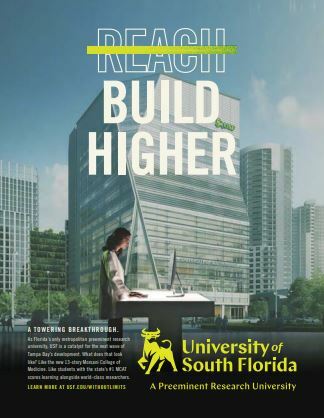 According to Hice, a marketing campaign for USF has never been as thorough or consistent in terms of building brand recognition. “This campaign is going to make your degree worth more and elevate the awareness and reputation of the university,” Hice said.